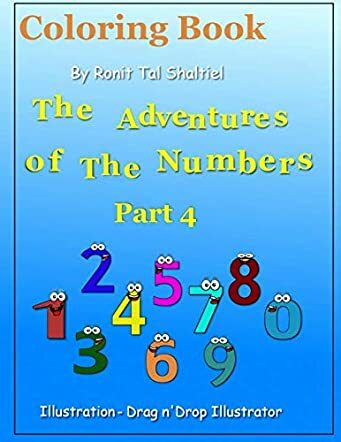 The Adventures of the Numbers: Part 4 – Addition and Subtraction by Ronit Tal Shaltiel is an interactive and educational book for children where math is presented in a fun way. The book has numbers from one to ten and for kids who are beginning to learn math and numbers, this book is good to read. Children can color the numbers and the objects representing the numbers, making learning exciting and interesting. They also learn that there is more than one way to get the same result. All the math exercises in the book relate to numbers and objects and it is not only educational, but will also make young readers think. This book is the perfect way to teach math and numbers one to ten to children who are starting to learn numbers. The coloring part and the exercises are fun to do, yet they teach children in a manner that learning becomes interactive and not a tiring and boring experience. It is an excellent book for classroom math learning and can be used by parents as well at home to teach their children math and the many ways to get one result. Books like this are good tools to make learning a fun experience and children will love to color the numbers and objects, making the concept of addition and subtraction look easy. The coloring part also gives them the opportunity to show their imagination and creativity. It is a must-have book in homes where there are children who are going to start school as it helps parents to teach in a way that learning math becomes fun and easy.